In the year since we published Lady Weirsdale, there have been a number of changes made at Gloria Austin’s Florida Carriage Museum and Resort. She has recently sold her operation to her ex-husband, Tom Golisano. The facility will now be renamed; The Grand Oaks. The good news is that the fabulous carriage museum will stay intact along with the carriage driving school and there will be an expanded event schedule. Mr. Golisano is planning several improvements to the property and facilities. Gloria plans to stay involved with the education programs and you may still see her driving from time to time. At this writing, Kacy Tipton-Fashik has stayed on as equine manager. 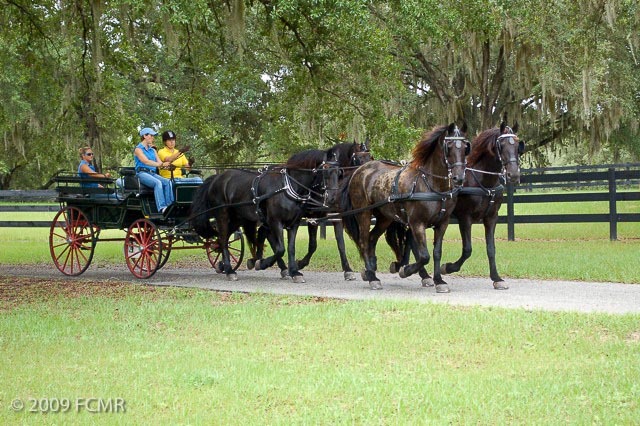 Kacy has developed into an excellent driver, instructor and was honored to be chosen as Gloria’s second; Kacy was the whip for the coaching demonstration at the 2011 Live Oak International. She took the box seat and drove the elegant Healey Park Drag put to a team of four Friesian horses. Well done Kacy! Gloria herself enjoyed a springtime excursion to the UK to visit with old friends from her coaching days- among them; coachman John Parker and Gloria’s former teacher and carriage collection advisor David Saunders. 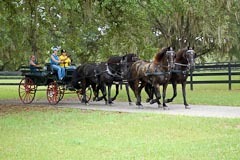 Gloria Austin’s contribution to carriage driving is without equal. We wish her all the best in her future endeavors. With the success of the 2011 Road to the Horse Legends event, only one question remains; “How are you going to top this?” Event producer Tootie Bland’s answer? Go global! 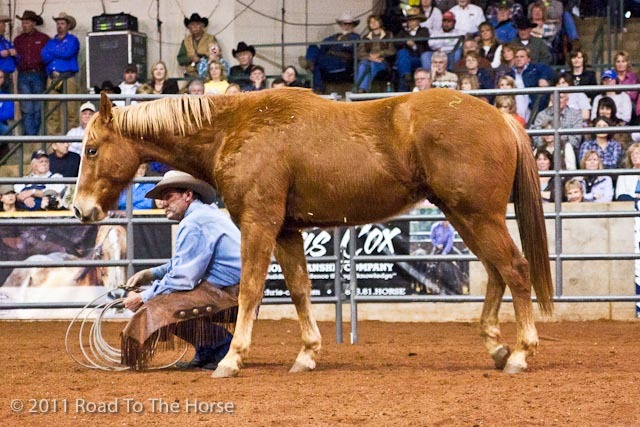 Find the world’s best clinicians, place them in an innovative international team format and let them go toe to toe for the World Championship of Colt Starting at the 2012 Road to the Horse 9-11 March, 2012, in Murfreesboro, Tennessee, USA. Traditionally, three to four clinicians have been matched up for this prestigious competition. The event format gives competitors just a few short hours over two days to train an untouched young horse. The colts must accept a rider in front of a live audience and the attentive eyes of the judges and press corp. While training has been limited to two days in the past, the 2012 event will feature round pen sessions on all three days. Tickets for Road to the Horse 2012 will go on sale July 4, 2011. Members of the Road to the Horse Nation, the event’s exclusive fan club, will have access to advanced ticket sales beginning June 21, 2011. For an annual fee of only $39.95, Nation members receive privileges such as advance ticket purchase opportunities, a special prime seating section, merchandise and apparel discounts, early admission to the event and an interactive Road to the Horse Nation website. Event owner and producer Tootie Bland is equally excited about this new approach to the competition. “We have invited Australia and Canada to see if they can match the talent in the United States. National Pride is on the line. There is going to be more horsemanship in one arena than ever before. I can’t wait for this one!”. 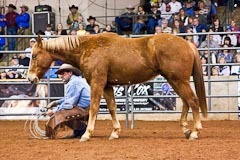 For more information on Road to the Horse 2012, visit www.roadtothehorse.com or call 325-736-5000.